Upon their first meeting, Laura Meade is immediately attracted to Eli Yoder, one of the Plain People, but Laura has no real concept about faith, God's love, and forgiveness of sins. Eli is also enamored with Laura, but to marry outside his faith would be forbidden. What then is the hope for love? 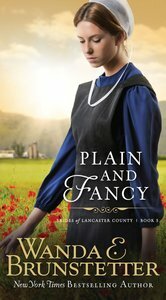 About "Plain and Fancy (#03 in Brides Of Lancaster County Series)"